This is a very small and slender ant which is omnivorous and a native of S. America, it is now well established in the U.K. and Europe in heated buildings and is very hard to eradicate. 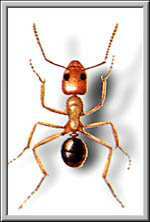 This is one of the species of ant which does not swarm, instead the ants spread by fragmentation of the colony. This ant is about 4 mm long. All ants are holometabolous (complete metamorphosis), having an egg, larval, pupal, and adult stage. 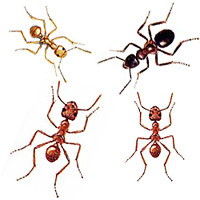 Foraging adult ants are only a fraction of the total colony. Broadcast spraying around the perimeter of the house targets only the foraging adult ants in the colony. Control will be temporary since the colony will simply send out more foraging ants when others are killed. The colony supports multiple queens if ant populations are large. If a broadcast spray around the house is the primary method of control, the Argentine ant workers and queens will scatter. When the ants scatter in sufficient numbers, new colonies can be formed. The one main colony can split into several smaller ones, all of which have the potential to grow. Thus, broadcast spraying alone can make the problem worse. Unlike many other ant species, Argentine ants from different colonies do not fight. Therefore, their spread is less limited because they are not territorial. Even with their large colony size, they are quite mobile and can move from one area to another quickly. A broadcast spray may temporarily alleviate an Argentine ant infestation. But there is a good possibility that the ants will simply move to another area until the chemical breaks down. After the chemical breaks down, the ants will return because they are constantly scouting and foraging for food, water, and nesting sites. Heavy mulch against the walls of houses creates pockets of moisture that these ants need. Potted plants are a favorite nesting site. Moving infested pots into the house can create an indoor infestation. These characteristics combine to create a pest control nightmare. Argentine ant control is an on-going effort. Due to the large size of colonies and their rapid mobility, even if one colony is eliminated, another will move into the area over time. An Integrated Pest Management (IPM) approach offers a greater chance for control of the Argentine ant. An IPM approach incorporates all available control methods into a pest management program. IPM methods include identification, inspection, sanitation, exclusion, and chemical strategies. Baits work because they exploit the ants' behavior of sharing food and nutrients with other ants. Passing nutrients from one ant to another is called trophallaxis. 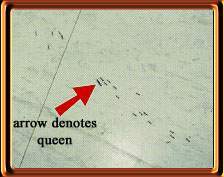 If food contains a slow-acting toxicant and the ant does not detect it, the toxicant is passed throughout the colony by trophallaxis, before killing its members, including the queen. Ant baits work only if the ants eat the bait. Eliminate any alternate food sources by keeping counters clean and storing food in sealed containers. Good pest control operators have the training, equipment, and materials necessary to perform ant control safely and effectively. You may prefer to have all of your pest control done by a professional because effective pest management required extensive knowledge of IPM tactics. If you do contract the services of a pest control operator, ask questions about the plan to control your pest problems and get estimates from at least three reputable firms before choosing one. Use pesticides ONLY according to the directions on the label. Follow all directions, precautions, and restrictions that are listed. Do not use pesticides for any other use than as directed by the label.